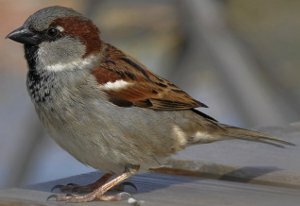 The male House Sparrow has a grey cap, black bib, grey underside and a chestnut-brown back. It has a distinctive white wing bar and a plain brown tail. Resident breeder throughout nearly all of Europe. Numbers in the UK are declining fast and it is considered a red list species. One reason suggested is lack of suitable nest sites on new and well maintained houses. 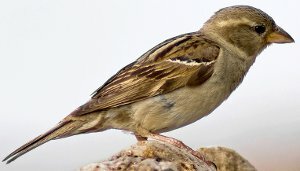 A much loved bird by many, the House Sparrow is one of the most widely distributed birds in Europe. There are now serious concerns about dwindling numbers in the UK and it is classified as a red list species. 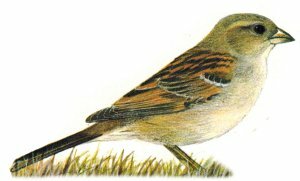 As it's name suggests the House Sparrow lives alongside people, nesting mostly in gaps in the eaves of houses and buildings. A fascinating book exploring the relationship between man and sparrow. 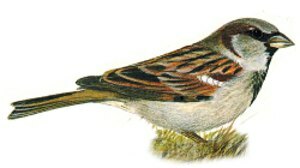 The female House Sparrow lacks the black bib and chestnut head markings of the male, she is overall much duller and plainer. Note the faint eye stripe and wing bar on this female. Note the black bib and chestnut-brown stripe on the head and neck, in winter these marks are usually less pronounced.